The government today announced a price of Rs 485 per share for public offer of its residual equity in the CMC and offered a discount to retail investors who would be allotted shares at Rs 460.75 per share. Punjab-based steel and pig iron industry today welcomed the steps taken by the government to check the rising steel prices saying this would increase the supply of steel in the domestic market. Lupin Ltd said today it has entered into an agreement with Baxter Healthcare Corporation, a US-based medical products company, for exclusively distributing the company’s generic version of Ceftriaxone Sterile Vials for injection in the US. Union Finance Minister Jaswant Singh today ruled out any revision in the projected inflation rate target of 4.5 per cent as against the present 5.68 per cent. The President of the Lahore Chamber, Mian Anjum Nisar, announced a joint platform with Amritsar business associations to work for the promotion of business among the two closest cities across the border. Mr Nisar said at a large gathering of Industrialists that chamber in Lahore would offer all facilities. The Textile and Apparel Designing Department of College of Home Science, Chaudhary Sarwan Kumar Himachal Pradesh Agriculture University, Palampur, has successfully extracted eco-friendly colours for Holi out of the extracts of leaves and roots. HSBC Holdings Plc said it plans to move 6,000 jobs to support centres in India, China and Malaysia by the end of 2004. Himachal Pradesh Marketing Board Chairman Satya Prakash Thakur said middlemen and other agencies got about 70 per cent of the value and farmer, who worked hard to produce and bring it to the market, earned only 30 per cent of the value. Exports continued its double-digit march growing by 12.83 per cent during the April-January period this fiscal year as compared to the same period last year. The Federation of Indian Export Organisations (FIEO) has called upon the Centre to withdraw its decision to reduce the Duty Entitlement Passbook Benefit (DEPB) rates by 33 per cent announced in the interim Budget. It has claimed that the decision to reduce the DEPB rates and appreciation of rupee by about 10 per cent against dollar have affected the growth of exports in India. Maruti Udyog today reported a massive 61.8 per cent sales growth in February, 2004, due to surging demand for compact cars. US says India is a right place for intellectual property production. Chennai's sun-kissed beaches a hit with foreign tourists. With the completion of disinvestment process in the CMC, the government would add Rs 190 crore to its kitty, an official statement said, adding that the issue was oversubscribed by 11.3 times. The government had last week completed the process of sale of its residual equity in IPCL through a public offering and with the successful CMC float, it has now mopped up Rs 1,390 crore from both the floats. The government received the bids for 44.9 million shares against 3.98 million shares on the block. As much as 50 per cent of the shares would be allocated to retail and non-institutional investors, with the balance going to Qualified Institutional Buyers (QIBs), and the process of actual allotment to investors starts from today. Disinvestment Minister Arun Shourie and Secretary Dhirendra Singh could not be contacted for comments. The CMC offer, where the government had fixed a floor price of Rs 475 per share had closed on February 28 amid a tremendous response that resulted in an oversubscription of 11.3 times. HSBC securities and Capital Markets and Enam Financial Consultants were appointed the book running lead managers for the CMC issue, which was conducted through the book building route. Earlier in November 2001, Tata Group had acquired 51 per cent stake in the company along with management control, for Rs 151 crore at Rs 197 per share. However, a subsequent open offer attracted a lukewarm response. Besides the CMC and IPCL, the government would also offload its residual equity in the IBP through a public issue of 5.7 million shares. It would also offload, through public offerings, 10 per cent stake each in Gail and ONGC, and divest about 20 per cent stake in state-owned Dredging Corporation of India Ltd (DCIL). The Gail public issue opened on February 27 and is slated to close on March 5, while the ONGC public offer is scheduled to open on March 5. The Apex Chamber of Commerce and Industry, Punjab, said the Centre must also take such steps in the case of sponge iron as its prices have gone up to Rs 14,000 a tonne from Rs 7,000 per tonne in just two years. This has happened despite the fact when there was no corresponding increase in the prices of inputs, it said in a statement. “It is very unfortunate to note that sponge iron manufacturers are also alleged to be resorting to evasion of central excise. The billing of sponge iron is allegedly being done at 50 or 60 per cent of the sale value,” it said. The chamber also pointed out that steel producers should be directed to increase the production of long products by up to 70 per cent while limiting the flat products’ production to 30 per cent. It asked the Centre to investigate into sponge iron manufacturers’ modus operandi to ensure reasonable prices of crucial input for the small scale industries. Lupin intends to launch the product in the US after the product patent expiry in July 2005, the Mumbai-based pharma company said, adding that the alliance provides Lupin access to the US Ceftriaxone vial market as well as the potential for other delivery systems. Earlier this fiscal year, Lupin received the US Food and Drug Administration (USFDA) approval for the company’s Abbreviated New Drug Application (ANDA) for Ceftriaxone Vials for injection 250 mg, 500 mg, 1g and 2g, the generic equivalent of Rocephin marketed by Roche. The market size of Rocephin in the United States is $ 700 million. ‘’We continue to stand by that rate projected by both the Reserve Bank of India and the Ministry of Finance,’’ he told newspersons on the sidelines of ‘’India on the Move’’ — a function organised by the Bharatiya Janata Party here. He ruled out any review on the sale of government stake in the public undertakings and said that the initial public offerings of PSUs were a great success. He denied there was any change in the fiscal estimates. Asked whether the move to cut excise duty on steel and release of more sugar into the system amounted to check inflation rate, he replied in the negative. Steps had been necessitated with steel versus sick industry up till about eight months ago. Several measures were taken to revive the steel sector as India could not be on the move without a dynamic and growth-oriented steel industry, he felt. When asked whether the Centre would prematurely clear some government loans, he declined to comment stating that the model code of conduct was in force in view of the election schedule announced by the Election Commission yesterday. The attempt has been made under the All-India Coordinated Research Project. Dr Asha Bansal, scientist and Head of Department of Textiles and Apparel Designing of the college is the principal investigator. Dr Bansal said women of Padhiarkhar village, about 8 km from the university, has been encouraged to adopt the technology for making eco-friendly colours. At the end of 2003, the lender employed 8,000 persons at such centres. Chief Executive Officer Stephen Green said he expects the process to “continue”, at a press conference in Hong Kong. HSBC, which said today that its 2003 profit rose 41 per cent to $ 8.77 billion bouyed by its purchase of Household International Inc. last year, and other financial institutions are moving jobs to Asia, where labour is cheaper, to save on costs. Himachal Pradesh Marketing Board Chairman Satya Prakash Thakur said middlemen and other agencies got about 70 per cent of the value and farmer, who worked hard to produce and bring it to the market, earned only 30 per cent of the value . Mr Thakur, who participated in Bhumi Poojan of Rs 1.5 crore sub-market yard at Palampur, said unless the situation was improved, the farmer would not be able to reap the full benefits of his crop. He said the HP Marketing Board had now launched a programme to ensure that the farmers, flower growers and horticulturists in the state were trained and equipped to enjoy the fruits of their labour. The board had started setting up modern markets where the farmers would be provided with the facilities for sale of their produce and also imparted training so that they could adopt modern techniques. He said facilities for buying and selling, setting up of ropeways to ensure speedy transport of produce from distant areas and providing refrigerated vans for transportation of perishable commodities were some of the steps being taken to help the farmers of Himachal Pradesh. Experts from the Mahrashtra State Agriculture Marketing Board had been asked to help the Dhalli market at Shimla. Giving details of the Rs 1 .5 crore sub-market yard at Palampur whose Bhumi Poojan was done by Revenue Minister B.B.L. Butail yesterday, Mr Thakur said in Phase I, the area would be developed and 15 shops, auction platform, parking and other facilities would be provided at a cost of Rs 88 lakh. Exports during April to January, 2003-04, were valued at $ 47,502.50 million which is 12.83 per cent higher than the level of $ 42,100.55 million during the corresponding period of the previous fiscal year. Exports during January, 2004, were valued at $ 5117.86 million which is 8.74 per cent higher than the level of $ 4,706.69 million during January, 2003. 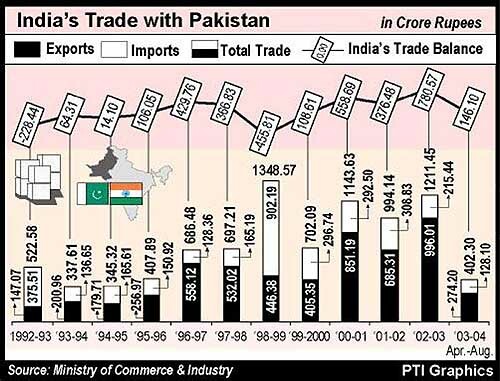 Official figures released disclosed that India’s imports during April to January, 2003-04, were valued at $ 61,933.02 million representing an increase of 24.70 per cent over the level of imports valued at $ 49,667.14 million during the same period last year. Oil imports during April to January, 2003-04, were valued at $ 16,643.08 million which is 15.91 per cent higher than oil imports valued at $ 14,358.62 million in the corresponding period last year. Non-oil imports during April to January, 2003-04, was estimated at $ 45,289.94 million which is 28.27 per cent higher than the level of such imports valued at $ 35,308.52 million in April-January, 2002-03. 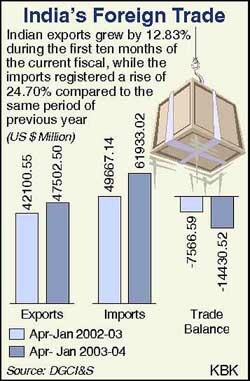 Imports during January, 2004, were valued at $ 6,579.72 million representing an increase of 18.11 per cent over the level of imports valued at $ 5,570.97 million in January, 2003. The trade deficit for April-January, 2003-04, was estimated at $ 14,430.52 million which is higher than the deficit at $ 7,566.59 million during the same period in the last fiscal year. Mr M Rafeeque Ahmed, President, FIEO, claimed that though the exporters had booked export orders with long-term commitments but by cutting down the DEPB rates by 33 per cent from February 9, 2004, the government had hit hard the earnings of the exporters. The DEPB entitles the exporters to claim refund of different taxes paid on raw material to produce export items from the government. The federation claimed that though exporters were making efforts to maintain the growth rate in exports, but the government was not providing adequate support. “The government has not even implemented simple measures like availability of dollar denominated credit to exporters. The Gold Card scheme announced in the Exim Policy on January 28, 2004, has remained on paper,” lamented Mr Ahmed. The company sold 42,263 units in the review month over 26,113 units sold in February, 2003. While domestic sales grew by 68.5 per cent to 39,241 units, exports went up by 7 per cent to 3,022 units. Maruti’s cumulative (April-February, 2003-04) sales jumped 33 per cent to 4,19,422 units. Domestic sales increased 30 per cent to 3,76,529 units while exports climbed 53 per cent to 42,893 units. Sales of Maruti’s bread-and-butter model M800 grew by 21.8 per cent to 13,518 units while Omni van and multi-purpose-vehicle Versa clocked 37.7 per cent growth at 4,779 units. In the compact car category, sales of Alto, WagonR and Zen soared 165.8 per cent to 19,179 units. In the mid-size car, Esteem and Baleno posted a 101.9 per cent jump to 1,387 units. Hero Honda Motors said today sales crossed the 2 lakh unit mark in February, 04, at 2,04,555 units, a growth of 52 per cent over 1,34,763 units sold during the corresponding month last year. This is the third time this fiscal that the company sales have crossed two lakh units. The successful performance of Hero Hondas new models has once again pushed its sales. Ambition135 has received a tremendous response from customers and was ably backed up by Splendor Plus, Passion Plus and CD-Dawn, the company said. Hero Honda’s cumulative sales for April, 2003, — February, 2004, period grew 20 per cent from a level of 15,61,815 motorcycles last fiscal to 18,77,976 units. TVS Motor Co today reported a 3.71 per cent sales rise in February, 2004, to 96,408 units over 92,951 units in the same month last year and said it would launch a variant of Fiero motor cycle this month. Motor cycle sales dipped 3.23 per cent to 59,286 units owing to drop in sales of two-stroke Max range of motor cycles, a company statement said. Banking on recently launched motorcycles — Centra and FieroF2 — and future launches, the company was confident of growth in the motor cycle category in the near future, it said. The Chennai-based firm will launch Style version of Fiero in March. Bajaj Auto (BAL) has reported a 10 per cent rise in motorcycles sales at 84,170 units in February over the same month of last year. The company also entered the Philippines market last month by launching Bajaj BYK, Caliber-115 and Wind-125 through Kawasaki Motor Philippines Corporation, BAL said in a release here today. The demand for three wheelers continued to be strong both in the domestic and export markets as sales were up by 41 per cent at 20,120 units.